443 Marlborough is located on the north side of Marlborough, between Massachusetts Avenue and Charlesgate East, with 441 Marlborough to the east and 445 Marlborough to the west. 443 Marlborough was built in 1885 for Chadwick & Stillings, for speculative sale, one of eight contiguous houses (431-445 Marlborough). Chadwick & Stillings (N. Henry Chadwick and Oscar L. Stillings) was a hat block and flange company that became a significant house building firm in the 1880s and 1890s. 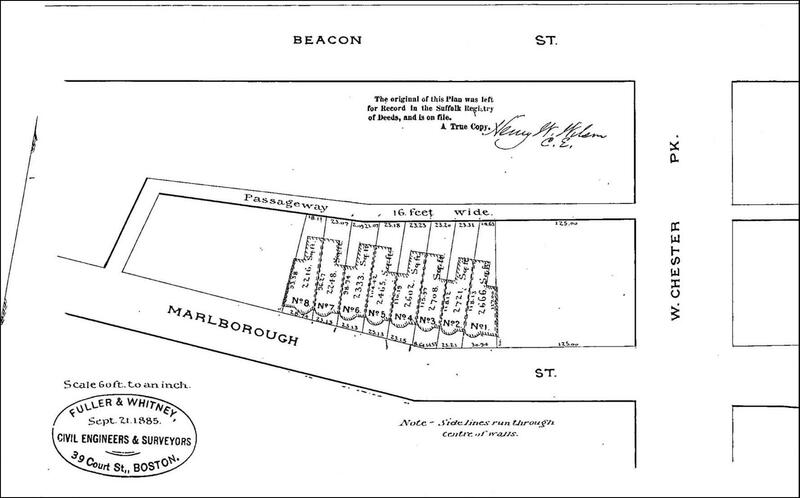 They are shown as the owners, architects, and builders on the original building permit applications for 431-445 Marlborough, dated June 16, 1885, and on the final building inspection report, dated November 13, 1886. 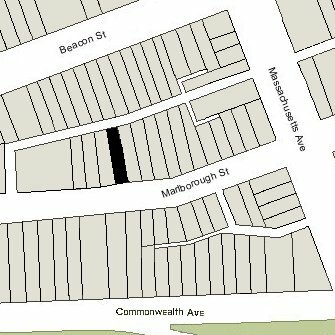 Click here for an index to the deeds for 443 Marlborough, and click here for further information on the land west of Massachusetts Avenue between the south side of Beacon and the north side of Commonwealth. On May 26, 1886, 443 Marlborough was purchased from N. Henry Chadwick and Oscar Stillings by Edward Burgess. He and his wife, Caroline Louisa (Sullivant) Burgess, made it their home. They previously had lived at 300 Beacon. By the 1887-1888 winter season, they had moved to 425 Marlborough. On October 14, 1887, 443 Marlborough was acquired from Edward Burgess by Mary Ann (Barney) Frothingham, the wife of Ward Brooks Frothingham. They previously had lived at 26 Appleton. Ward Frothingham died in November of 1893. Mary Frothingham continued to live at 443 Marlborough during the 1896-1897 winter season, but moved thereafter and leased the house to others. 443 Marlborough was not listed in the 1898 Blue Book. During the 1898-1899 winter season, 443 Marlborough was the home of Herbert Putnam and his wife, Charlotte Elizabeth (Monroe) Putnam. They previously had lived in an apartment at 199 Marlborough. A lawyer and librarian by training, Herbert Putnam was Librarian of the Boston Public Library. In March of 1899, he was appointed by President McKinley as Librarian of the Library of Congress, and the Putnams moved to Washington DC. 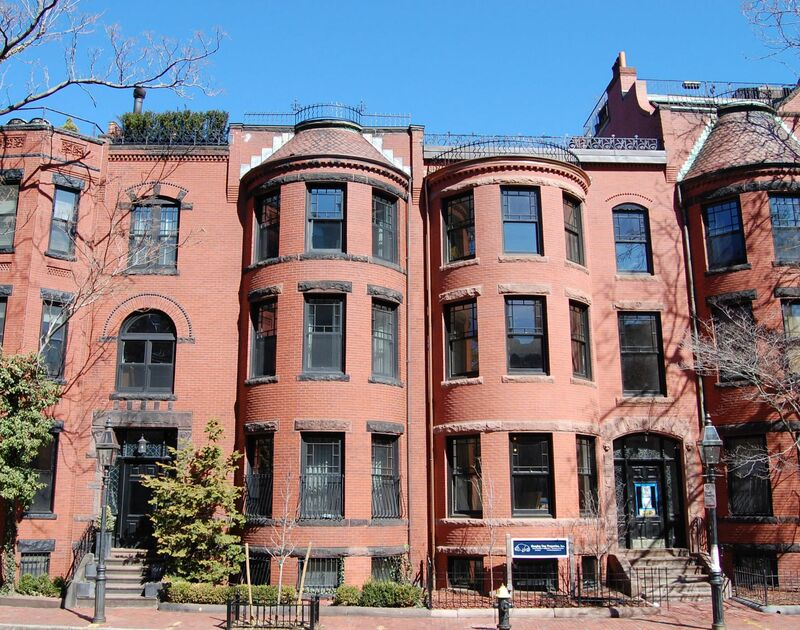 By the 1899-1900 winter season, 443 Marlborough was the home of retired boot and shoe manufacturer Channing Lilly and his wife, Frances Eleanor (Ballister) Lilly. They previously had lived at 53 Gloucester. Channing Lilly died in February of 1912. Frances Lilly continued to live at 443 Marlborough during the 1922-1923 winter season, but moved thereafter to an apartment at 290 Commonwealth. On April 27, 1922, Mary Ann Frothingham transferred 443 Marlborough to her daughter, Marian Brooks (Frothingham) Eckstrom, the wife of Carl Magnus Wilhelm Eckstrom. The Eckstroms lived in New York City, where he was an actor on the stage and in silent movies, and she was playwright. Mary Ann Frothingham lived with them. On August 3, 1923, 443 Marlborough was acquired from Marian Eckstrom by Dr. Charles Leonard Overlander. He and his wife, Ruth Lillian (Fitchett) Overlander, made it their home. They previously had lived in an apartment at 520 Beacon, where he also had maintained his medical office. Charles Overlander was a physician and pathologist. He served as director of the Pathological Laboratory of Brooks Hospital and also was an instructor at Harvard Medical School and a lecturer at Tufts Medical School. He maintained his office at 443 Marlborough. On April 21, 1933, he transferred 443 Marlborough into his and his wife’s names. Charles Overlander died in December of 1948 and Ruth Overlander moved soon thereafter. On June 27, 1949, 443 Marlborough was purchased from Ruth Overlander by Paul Verne Shaffer, an engineer and instrument maker at MIT, and his wife, Margaret E. (Hamilton) Shaffer. 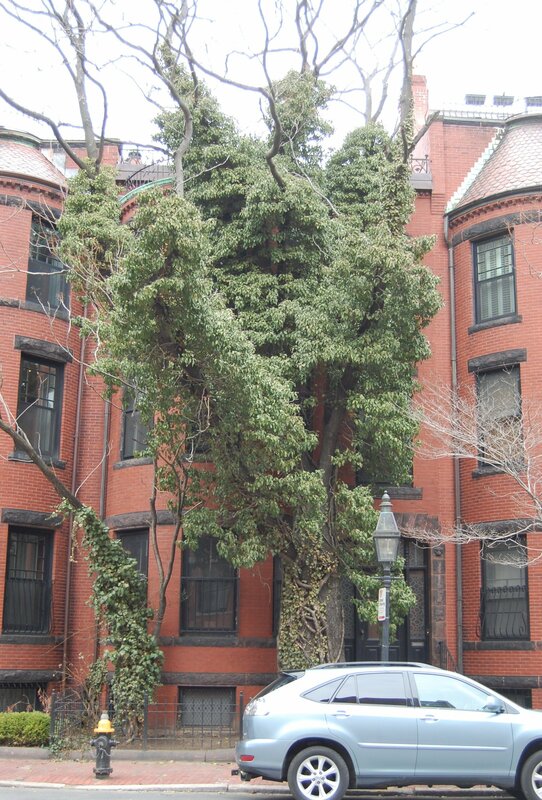 They previously had lived in an apartment at 387 Beacon, and before that at 351 Beacon. 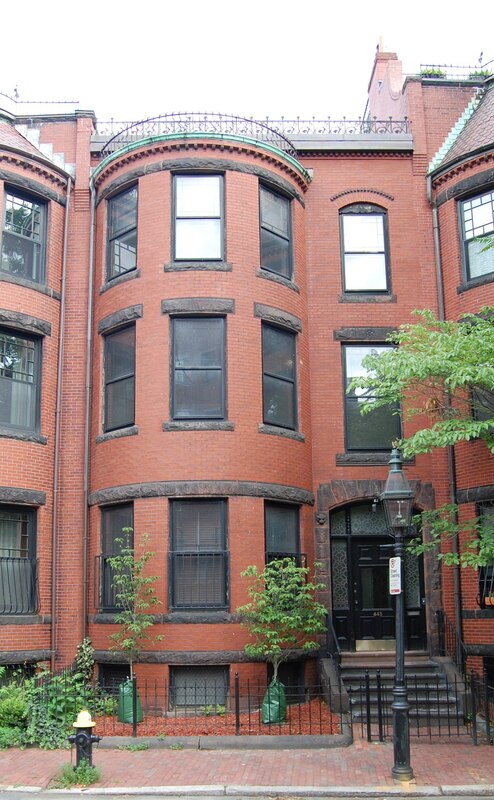 They continued to live at 443 Marlborough until about 1971. On July 1, 1971, 443 Marlborough was purchased from the Shaffers by Gerald J. Burnett and his wife, Marjorie J. Burnett. He was a systems consultant and later would co-found Avistar Communications, manufacturers and marketers of information technology network products. On January 30, 1975, 443 Marlborough was purchased from the Burnetts by Thomas P. Garrity, Jr.
On November 30, 1978, 443 Marlborough was purchased from Thomas Garrity by Jorge Silvetti and Rodolfo Machado, architects in the firm of Machado and Silvetti Associates. In February of 1979, they applied for (and subsequently received) permission to convert the property from a single-family dwelling with garage to a two-family dwelling with garage. On May 16, 2017, 443 Marlborough was purchased from Jorge Silvetti and Rodolfo Machado by Edmund DiSanto and his wife, Colleen DiSanto. 443 Marlborough remained a two-family dwelling in 2018.